Batten down the hatches! 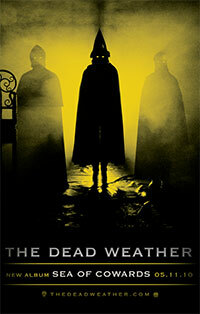 The Dead Weather are back. The Nashville-based 4-piece have announced plans for the release of their sophomore album Sea Of Cowards on May 11th, 2010. The new album is a robust and vigorous second act, filled with primal, bone quaking rock rhythms and the same stellar urban blues and throbbing sleaze as its predecessor; but this time The Dead Weather push their sound even further, brilliantly building upon their raw chemistry to create the most vital sounding album you’ll hear all year. The first single, “Die By The Drop,” is an agitated brain worm of a duet between Alison Mosshart and Jack White.